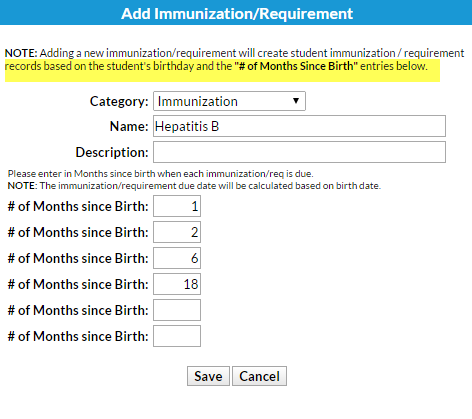 Before immunizations can be tracked for any student you must set the default immunization requirements for your facility. Point to Tools and select Edit Settings then click on Immunizations / Reqs. from the left hand menu. Click the Add Immunization / Requirement button. Select a Category (Immunization or Medical Requirement). Enter a Name, Description, and Due Dates. (Example: For an immunization due at 6 months and 18 months, enter a 6 in the first field and a 18 in the second field. Saved immunization and requirement templates remain listed under Tools > Edit Settings > Immunizations / Reqs. Order the templates by adding a number in the Order column. Save Changes then Refresh the screen to see the updated order. Delete a requirement using the trash can icon. Edit a requirement by making the changes in the appropriate columns then Save Changes.